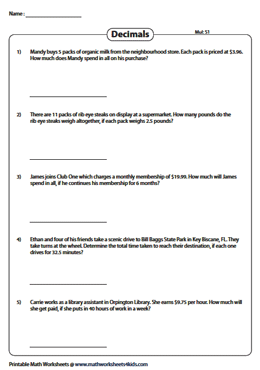 Extensive decimal word problems are presented in these sets of worksheets, which require the learner to perform addition, subtraction, multiplication, and division operations. Our decimal word problems are replete with engaging scenarios. Free samples are included. 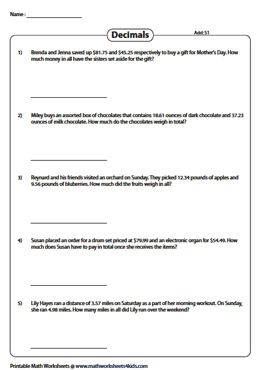 Decimal word problems presented here help the children learn decimal addition based on money, measurement and other real-life units. 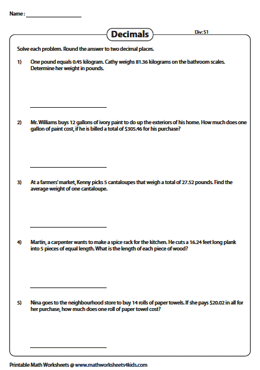 These decimal word problem worksheets reinforce the real-life subtraction skills such as tender the exact change, compare the height, the difference between the quantities and more. Each decimal word problem involves multiplication of a whole number with a decimal number. Find the product and check your answer using the answer key provided in the second page. These division word problems require children to divide the decimals with the whole numbers. Ask the children to perform the division to find the quotient by applying long division method. Avoid calculator. It's review time. 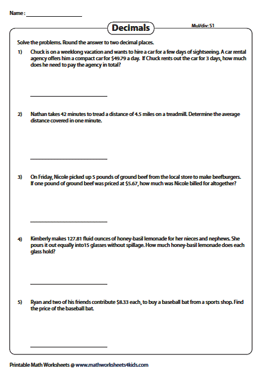 Take these worksheets that help you reinforce the knowledge in adding and subtracting decimals. 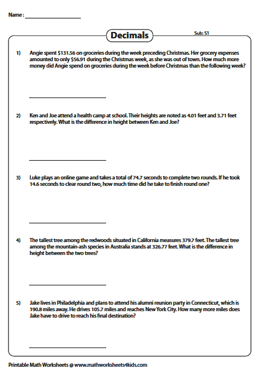 There are five word problems in each worksheet. 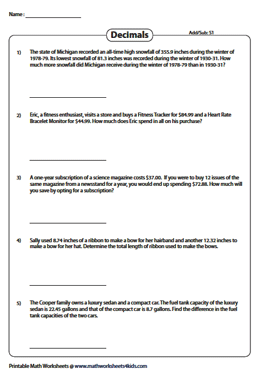 These decimal worksheets emphasize decimal multiplication and division. The perfect blend of word problems makes the children stronger in performing the multiplication and division operation.